From the Continental Divide of the Rocky Mountains to the oceanside majesty of the Coast Range, British Columbia truly lives up to its Latin motto: Splendour Sine Occasu—Splendour Without Diminishment. 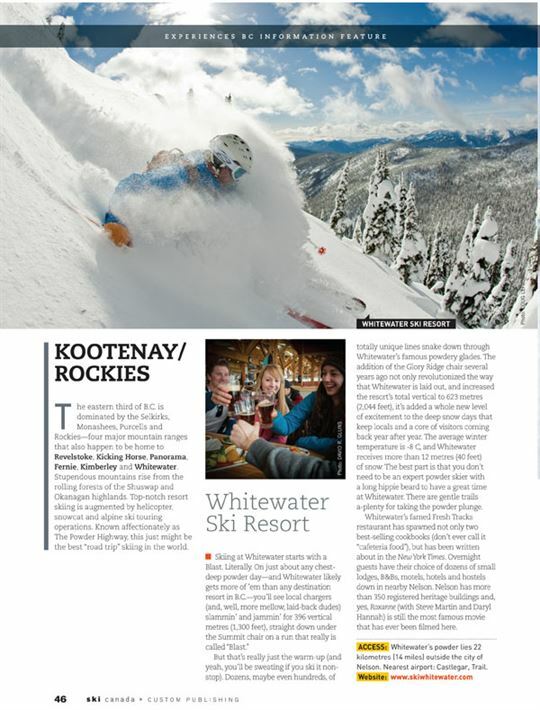 And if you’re a skier or snowboarder, “Super, Natural British Columbia” delivers unlimited experiences in so many ways: light, bountiful snowfall; endless runs suitable for all skill levels; a variety of accommodation to suit every budget and taste; and, of course, those crested waves of snowy peaks that stretch to the horizon. These are big mountains—on a par with anywhere in the world. When it comes to big-league vertical, four B.C. resorts crack North America’s top 10. But that doesn’t mean it’s inhospitable—anything but, in fact. B.C.’s intimate resort towns and mountain communities teem with a wild, even eccentric spirit that recalls the early pioneers and settlers. There’s an enormous amount of diversity here in both the lay of the land and its ever-changing weather. Compared to the rest of the country, daytime temperatures are often perfect any month of the ski season, and in spring, it can be a real treat to retire the insulated jacket for a pullover fleece (just don’t forget to pack the sunscreen). From early November right through into May, storms brewing in the North Pacific spread their way across B.C., dumping some impressive and enviable snowfalls that enable B.C.’s top-10 destination resorts to spring into action well before Christmas. These epic storms—augmented by sophisticated snowmaking systems—instantly transform barren slopes into the perfect white carpet for skiing and riding. Add it all up, and B.C. skiing and riding has every conceivable option of holiday for beginners and experts alike. The eastern third of B.C. is dominated by the Selkirks, Monashees, Purcells and Rockies—four major mountain ranges that also happen to be home to Revelstoke, Kicking Horse, Panorama, Fernie, Kimberley and Whitewater. Stupendous mountains rise from the rolling forests of the Shuswap and Okanagan highlands. 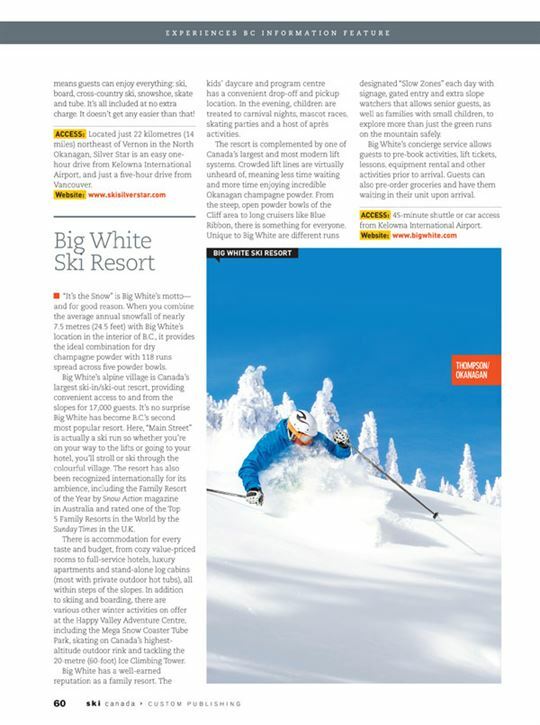 Top-notch resort skiing is augmented by helicopter, snowcat and alpine ski touring operations. Known affectionately as The Powder Highway, this just might be the best “road trip” skiing in the world. But that’s really just the warm-up (and yeah, you’ll be sweating if you ski it non-stop). Dozens, maybe even hundreds, of totally unique lines snake down through Whitewater’s famous powdery glades. The addition of the Glory Ridge chair several years ago not only revolutionized the way that Whitewater is laid out, and increased the resort’s total vertical to 623 metres (2,044 feet), it’s added a whole new level of excitement to the deep snow days that keep locals and a core of visitors coming back year after year. The average winter temperature is -8 C, and Whitewater receives more than 12 metres (40 feet) of snow. The best part is that you don’t need to be an expert powder skier with a long hippie beard to have a great time at Whitewater. There are gentle trails a-plenty for taking the powder plunge. Whitewater’s famed Fresh Tracks restaurant has spawned not only two best-selling cookbooks (don’t ever call it “cafeteria food”), but has been written about in the New York Times. Overnight guests have their choice of dozens of small lodges, B&Bs, motels, hotels and hostels down in nearby Nelson. Nelson has more than 350 registered heritage buildings and, yes, Roxanne (with Steve Martin and Daryl Hannah) is still the most famous movie that has ever been filmed here. ACCESS: Whitewater’s powder lies 22 kilometres (14 miles) outside the city of Nelson. Nearest airport: Castlegar, Trail. 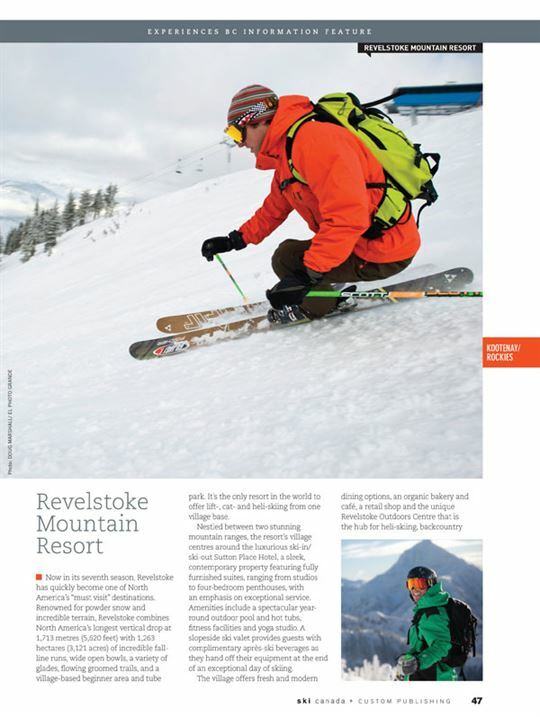 Now in its seventh season, Revelstoke has quickly become one of North America’s “must visit” destinations. Renowned for powder snow and incredible terrain, Revelstoke combines North America’s longest vertical drop at 1,713 metres (5,620 feet) with 1,263 hectares (3,121 acres) of incredible fall-line runs, wide open bowls, a variety of glades, flowing groomed trails, and a village-based beginner area and tube park. It’s the only resort in the world to offer lift-, cat- and heli-skiing from one village base. Nestled between two stunning mountain ranges, the resort’s village centres around the luxurious ski-in/ski-out Sutton Place Hotel, a sleek, contemporary property featuring fully furnished suites, ranging from studios to four-bedroom penthouses, with an emphasis on exceptional service. Amenities include a spectacular year-round outdoor pool and hot tubs, fitness facilities and yoga studio. A slopeside ski valet provides guests with complimentary après-ski beverages as they hand off their equipment at the end of an exceptional day of skiing. The village offers fresh and modern dining options, an organic bakery and café, a retail shop and the unique Revelstoke Outdoors Centre that is the hub for heli-skiing, backcountry programs, cat-skiing and lessons. Parents can utilize the childcare facilities or enrol their children at the kids-only centre for lessons and activities. Located in Revelstoke, Selkirk Tangiers Helicopter Skiing offers packages from one to seven days and provides options for first-time heli-skiers and experienced clients looking for an exclusive private package. In operation for more than 36 years, Selkirk Tangiers is renowned for receiving an impressive annual snowfall of 12-18 metres (40-60 feet) of light, dry powder and its 202,342 hectares (500,000 acres) of exclusive terrain. With a skiing history of more than 100 years and an authentic ski-town atmosphere just minutes away, Revelstoke Mountain Resort offers a ski adventure like no other. 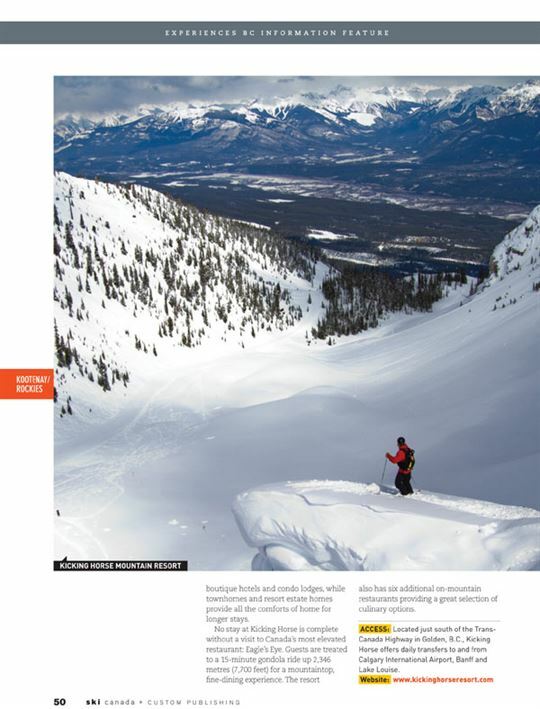 Nestled between the Purcells and Rocky Mountains, Kicking Horse offers an integrated mountain resort experience with some of the most progressive inbounds skiing in North America. The mountain consists of 1,260 metres (4,133 feet) of vertical—fourth in North America. An eight-passenger, high-speed gondola, plus two fixed-grip quad chairlifts, a two-person chairlift and a Magic Carpet surface lift service 121 runs, four alpine bowls and 85 inbound chutes, spread over 1,133+ hectares (2,800+ acres) of skiable terrain. The resort provides beginner experiences at an area located in the main plaza with a Magic Carpet lift. 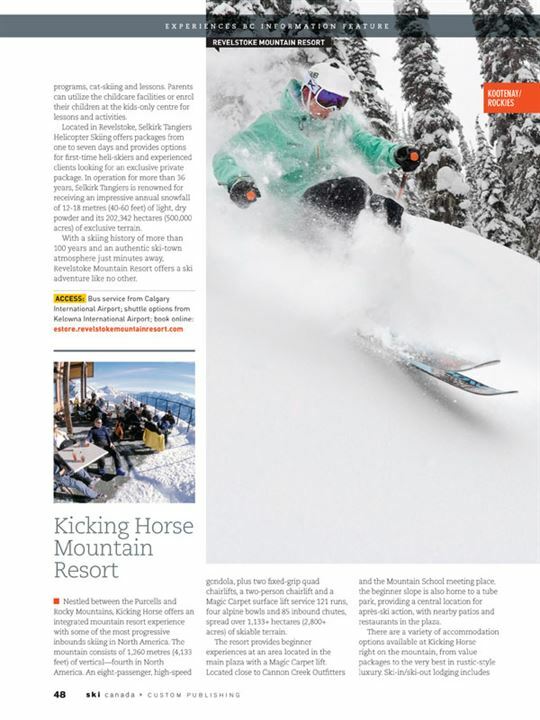 Located close to Cannon Creek Outfitters and the Mountain School meeting place, the beginner slope is also home to a tube park, providing a central location for après-ski action, with nearby patios and restaurants in the plaza. There are a variety of accommodation options available at Kicking Horse right on the mountain, from value packages to the very best in rustic-style luxury. Ski-in/ski-out lodging includes boutique hotels and condo lodges, while townhomes and resort estate homes provide all the comforts of home for longer stays. No stay at Kicking Horse is complete without a visit to Canada’s most elevated restaurant: Eagle’s Eye. Guests are treated to a 15-minute gondola ride up 2,346 metres (7,700 feet) for a mountaintop, fine-dining experience. The resort also has six additional on-mountain restaurants providing a great selection of culinary options. ACCESS: Located just south of the Trans-Canada Highway in Golden, B.C., Kicking Horse offers daily transfers to and from Calgary International Airport, Banff and Lake Louise. Nestled in the majestic Selkirk and Rocky mountains of southeastern B.C., Kimberley enjoys more sunny days than any other resort in the province. With 80 runs shot through with open glades, the resort offers excitement for all ages and ability levels. Dive into the Easter Bowl on the mountain’s backside and experience non-stop fall lines and heart-stopping steeps. For smooth cruising, enjoy Kimberley’s frontside and ski right up to the Trickle Creek Lodge or the Stemwinder Bar and Grill. Kimberley is home to one of North America’s longest illuminated runs, making it a nighttime hot spot. Kimberley accommodates groups, weddings and meetings with the 2,229-square-metre (24,000-square-foot) Conference & Athlete Training Centre, located at the base village. Designed to exceed B.C. energy efficiency standards by more than 30 per cent and constructed entirely of local B.C. timber, this eco-friendly, multi-use conference and meeting space can facilitate up to 500 people and is used as a year-round venue. The building includes a variety of meeting spaces and a fully accessible athletic training centre. ACCESS: The Canadian Rockies International Airport in Cranbrook is accessible by regional air service on Air Canada Jazz and Pacific Coastal Airlines. The airport is located 20 minutes from Kimberley. With up to 11 metres (37 feet) of snowfall covering Fernie each year—the most in the Canadian Rockies—the resort offers 1,011 hectares (2,500 acres) of skiing spread across five separate bowls. 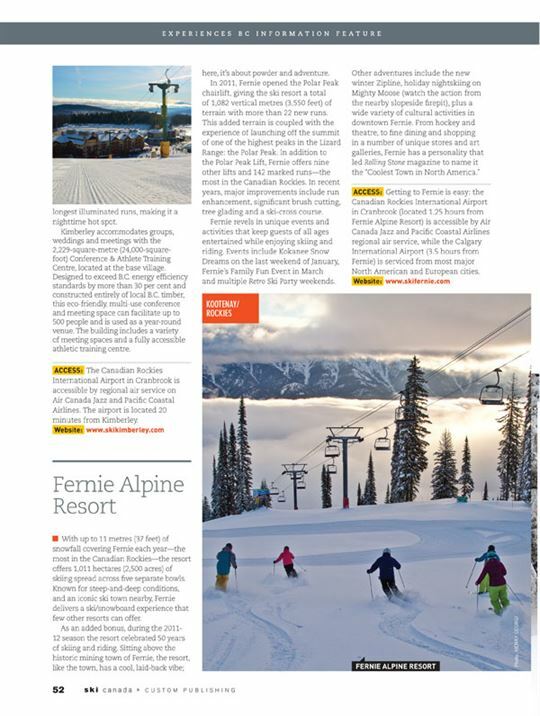 Known for steep-and-deep conditions, and an iconic ski town nearby, Fernie delivers a ski/snowboard experience that few other resorts can offer. As an added bonus, during the 2011-12 season the resort celebrated 50 years of skiing and riding. Sitting above the historic mining town of Fernie, the resort, like the town, has a cool, laid-back vibe; here, it’s about powder and adventure. In 2011, Fernie opened the Polar Peak chairlift, giving the ski resort a total of 1,082 vertical metres (3,550 feet) of terrain with more than 22 new runs. This added terrain is coupled with the experience of launching off the summit of one of the highest peaks in the Lizard Range: the Polar Peak. In addition to the Polar Peak Lift, Fernie offers nine other lifts and 142 marked runs—the most in the Canadian Rockies. In recent years, major improvements include run enhancement, significant brush cutting, tree glading and a ski-cross course. ACCESS: Getting to Fernie is easy: the Canadian Rockies International Airport in Cranbrook (located 1.25 hours from Fernie Alpine Resort) is accessible by Air Canada Jazz and Pacific Coastal Airlines regional air service, while the Calgary International Airport (3.5 hours from Fernie) is serviced from most major North American and European cities. At 1,219 vertical metres (4,000 vertical feet), Panorama boasts one of the highest verticals in the region, not to mention more than 120 trails, two alpine bowls and a terrain park that awaits fresh tracks every morning. 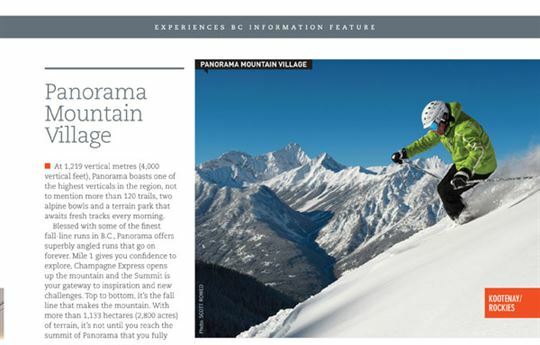 Blessed with some of the finest fall-line runs in B.C., Panorama offers superbly angled runs that go on forever. Mile 1 gives you confidence to explore, Champagne Express opens up the mountain and the Summit is your gateway to inspiration and new challenges. Top to bottom, it’s the fall line that makes the mountain. With more than 1,133 hectares (2,800 acres) of terrain, it’s not until you reach the summit of Panorama that you fully realize the magnitude of what this mountain has to offer. Everyone is in awe of the view from Panorama’s summit—the View of a Thousand Peaks is aptly named and will take your breath away. One of the most appealing attributes of the Mountain Village is its intimate layout that embraces guests in an unforgettable location. Easy and laid back, you forget the daily grind. Panorama has a range of ski-in/ski-out accommodation, situated in a slopeside village that’s built for walking. There’s even a “mini gondola,” which connects the upper and lower village, that your kids will love. Whether you’re with your family or on a romantic getaway, you’re at Panorama to relax. So lose the boots at your door and put your feet up, or dip them into the waters of Canada’s largest slopeside hot pools. Indeed, the entire Panorama region is a hot springs paradise—make sure to check out the Radium Springs Hot Pools near Kootenay National Park. Panorama is also unique in that the resort has daily heli-skiing and snowmobiling right from the village, offering an amazing big-mountain, deep-snow experience. ACCESS: Fly into Calgary and drive through Banff and Kootenay national parks. 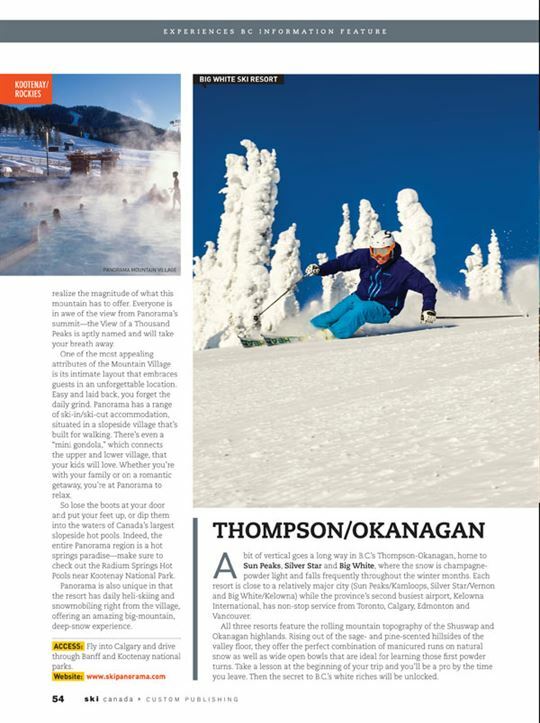 A bit of vertical goes a long way in B.C.’s Thompson-Okanagan, home to Sun Peaks, Silver Star and Big White, where the snow is champagne-powder light and falls frequently throughout the winter months. Each resort is close to a relatively major city (Sun Peaks/Kamloops, Silver Star/Vernon and Big White/Kelowna) while the province’s second busiest airport, Kelowna International, has non-stop service from Toronto, Calgary, Edmonton and Vancouver. All three resorts feature the rolling mountain topography of the Shuswap and Okanagan highlands. Rising out of the sage- and pine-scented hillsides of the valley floor, they offer the perfect combination of manicured runs on natural snow as well as wide open bowls that are ideal for learning those first powder turns. Take a lesson at the beginning of your trip and you’ll be a pro by the time you leave. Then the secret to B.C.’s white riches will be unlocked. 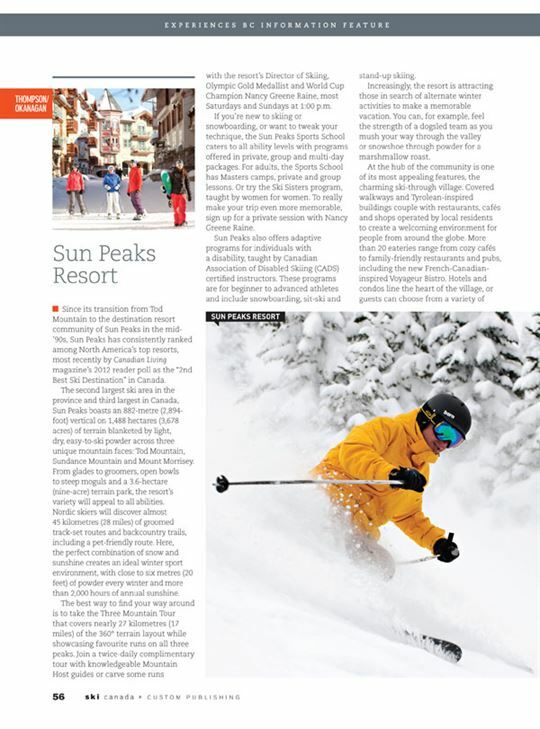 Since its transition from Tod Mountain to the destination resort community of Sun Peaks in the mid-’90s, Sun Peaks has consistently ranked among North America’s top resorts, most recently by Canadian Living magazine’s 2012 reader poll as the “2nd Best Ski Destination” in Canada. The second largest ski area in the province and third largest in Canada, Sun Peaks boasts an 882-metre (2,894-foot) vertical on 1,488 hectares (3,678 acres) of terrain blanketed by light, dry, easy-to-ski powder across three unique mountain faces: Tod Mountain, Sundance Mountain and Mount Morrisey. From glades to groomers, open bowls to steep moguls and a 3.6-hectare (nine-acre) terrain park, the resort’s variety will appeal to all abilities. Nordic skiers will discover almost 45 kilometres (28 miles) of groomed track-set routes and backcountry trails, including a pet-friendly route. Here, the perfect combination of snow and sunshine creates an ideal winter sport environment, with close to six metres (20 feet) of powder every winter and more than 2,000 hours of annual sunshine. The best way to find your way around is to take the Three Mountain Tour that covers nearly 27 kilometres (17 miles) of the 360° terrain layout while showcasing favourite runs on all three peaks. Join a twice-daily complimentary tour with knowledgeable Mountain Host guides or carve some runs with the resort’s Director of Skiing, Olympic Gold Medallist and World Cup Champion Nancy Greene Raine, most Saturdays and Sundays at 1:00 p.m. If you’re new to skiing or snowboarding, or want to tweak your technique, the Sun Peaks Sports School caters to all ability levels with programs offered in private, group and multi-day packages. For adults, the Sports School has Masters camps, private and group lessons. Or try the Ski Sisters program, taught by women for women. To really make your trip even more memorable, sign up for a private session with Nancy Greene Raine. Sun Peaks also offers adaptive programs for individuals with a disability, taught by Canadian Association of Disabled Skiing (CADS) certified instructors. These programs are for beginner to advanced athletes and include snowboarding, sit-ski and stand-up skiing. Increasingly, the resort is attracting those in search of alternate winter activities to make a memorable vacation. You can, for example, feel the strength of a dogsled team as you mush your way through the valley or snowshoe through powder for a marshmallow roast. At the hub of the community is one of its most appealing features, the charming ski-through village. Covered walkways and Tyrolean-inspired buildings couple with restaurants, cafés and shops operated by local residents to create a welcoming environment for people from around the globe. More than 20 eateries range from cozy cafés to family-friendly restaurants and pubs, including the new French-Canadian-inspired Voyageur Bistro. Hotels and condos line the heart of the village, or guests can choose from a variety of private homes available for rent, as well as townhomes and chalets spread throughout the valley. Wherever guests stay, the views are spectacular and most locations are ski-in/ski-out. ACCESS: Located 45 minutes north of Kamloops, Sun Peaks Resort is accessible through air gateways in Kamloops, Vancouver, Kelowna and Calgary. By car, Vancouver (4.25 hours) or Seattle (5.5 hours). Blanketed annually by seven metres (23 feet) of dry, feather-light champagne powder, Silver Star is a huge mountain with three distinct faces and 115 runs, bowls and gladed areas. The comfortable average daytime temperature of -5 C (27 F) is cold enough to keep the snow light and fluffy, yet perfect for all winter activities. With its long, beautifully manicured runs and great mountain views, south-facing and sunny Vance Creek is the most popular area. But it’s not all laid-back; here you’ll find more than six hectares (16 acres) in the Rockstar Terrain Park, packed with features challenging everyone from beginner to expert. The resort is renowned for turning out some of the world’s best freestyle skiers, including Josh Bibby, Justin Dorey and TJ Schiller. Closer to the village, the all-new Air Zone features a giant airbag alongside the new Jib Zone, the perfect place to first experience the thrill of mastering aerials and small rails before advancing into the larger Park areas. Serviced by its very own high-speed quad, Silver Woods features fall-line intermediate runs and more gentle glade (openly spaced tree) skiing. Best of all, you’ll likely have it all to yourself. 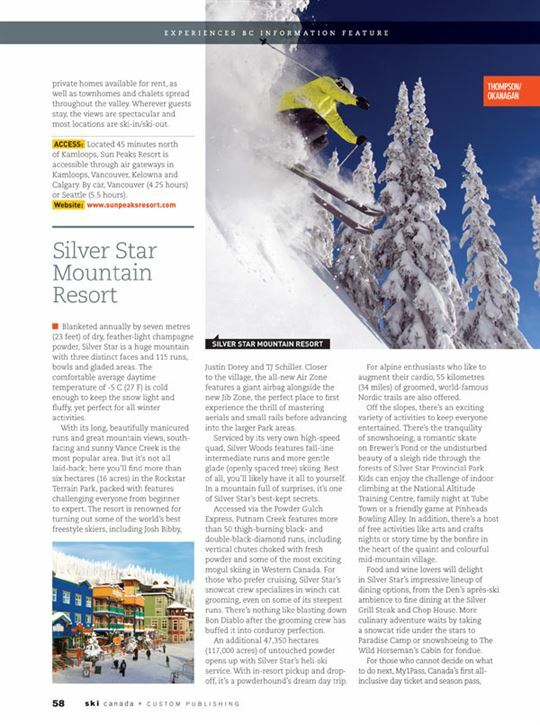 In a mountain full of surprises, it’s one of Silver Star’s best-kept secrets. Accessed via the Powder Gulch Express, Putnam Creek features more than 50 thigh-burning black- and double-black-diamond runs, including vertical chutes choked with fresh powder and some of the most exciting mogul skiing in Western Canada. For those who prefer cruising, Silver Star’s snowcat crew specializes in winch cat grooming, even on some of its steepest runs. There’s nothing like blasting down Bon Diablo after the grooming crew has buffed it into corduroy perfection. An additional 47,350 hectares (117,000 acres) of untouched powder opens up with Silver Star’s heli-ski service. With in-resort pickup and drop-off, it’s a powderhound’s dream day trip. For alpine enthusiasts who like to augment their cardio, 55 kilometres (34 miles) of groomed, world-famous Nordic trails are also offered. Off the slopes, there’s an exciting variety of activities to keep everyone entertained. There’s the tranquility of snowshoeing, a romantic skate on Brewer’s Pond or the undisturbed beauty of a sleigh ride through the forests of Silver Star Provincial Park. Kids can enjoy the challenge of indoor climbing at the National Altitude Training Centre, family night at Tube Town or a friendly game at Pinheads Bowling Alley. In addition, there’s a host of free activities like arts and crafts nights or story time by the bonfire in the heart of the quaint and colourful mid-mountain village. Food and wine lovers will delight in Silver Star’s impressive lineup of dining options, from the Den’s après-ski ambience to fine dining at the Silver Grill Steak and Chop House. More culinary adventure waits by taking a snowcat ride under the stars to Paradise Camp or snowshoeing to The Wild Horseman’s Cabin for fondue. For those who cannot decide on what to do next, My1Pass, Canada’s first all-inclusive day ticket and season pass, means guests can enjoy everything: ski, board, cross-country ski, snowshoe, skate and tube. It’s all included at no extra charge. It doesn’t get any easier than that! ACCESS: Located just 22 kilometres (14 miles) northeast of Vernon in the North Okanagan, Silver Star is an easy one-hour drive from Kelowna International Airport, and just a five-hour drive from Vancouver. “It’s the Snow” is Big White’s motto—and for good reason. When you combine the average annual snowfall of nearly 7.5 metres (24.5 feet) with Big White’s location in the interior of B.C., it provides the ideal combination for dry champagne powder with 118 runs spread across five powder bowls. Big White’s alpine village is Canada’s largest ski-in/ski-out resort, providing convenient access to and from the slopes for 17,000 guests. It’s no surprise Big White has become B.C.’s second most popular resort. Here, “Main Street” is actually a ski run so whether you’re on your way to the lifts or going to your hotel, you’ll stroll or ski through the colourful village. The resort has also been recognized internationally for its ambience, including the Family Resort of the Year by Snow Action magazine in Australia and rated one of the Top 5 Family Resorts in the World by the Sunday Times in the U.K. There is accommodation for every taste and budget, from cozy value-priced rooms to full-service hotels, luxury apartments and stand-alone log cabins (most with private outdoor hot tubs), all within steps of the slopes. In addition to skiing and boarding, there are various other winter activities on offer at the Happy Valley Adventure Centre, including the Mega Snow Coaster Tube Park, skating on Canada’s highest-altitude outdoor rink and tackling the 20-metre (60-foot) Ice Climbing Tower. Big White has a well-earned reputation as a family resort. The kids’ daycare and program centre has a convenient drop-off and pickup location. In the evening, children are treated to carnival nights, mascot races, skating parties and a host of après activities. The resort is complemented by one of Canada’s largest and most modern lift systems. Crowded lift lines are virtually unheard of, meaning less time waiting and more time enjoying incredible Okanagan champagne powder. From the steep, open powder bowls of the Cliff area to long cruisers like Blue Ribbon, there is something for everyone. Unique to Big White are different runs designated “Slow Zones” each day with signage, gated entry and extra slope watchers that allows senior guests, as well as families with small children, to explore more than just the green runs on the mountain safely. Big White’s concierge service allows guests to pre-book activities, lift tickets, lessons, equipment rental and other activities prior to arrival. Guests can also pre-order groceries and have them waiting in their unit upon arrival. ACCESS: 45-minute shuttle or car access from Kelowna International Airport. At Whistler Blackcomb, the statistics truly are staggering. It starts with the weather. Pacific storms collide with the Coast Mountain Range on B.C.’s south coast, reliably depositing more than 12 metres (38.5 feet) of snow each year, resulting in one of the longest ski seasons in North America—from November through May—with summer glacier skiing on Blackcomb Mountain’s Horstman Glacier June through the end of July. Equally impressive is the topography. Sixteen vast alpine bowls and three glaciers stretch down to meet more than 200 marked runs featuring a variety of glades, groomers and learning areas that make up the most terrain in North America at 3,307 hectares (8,171 acres). 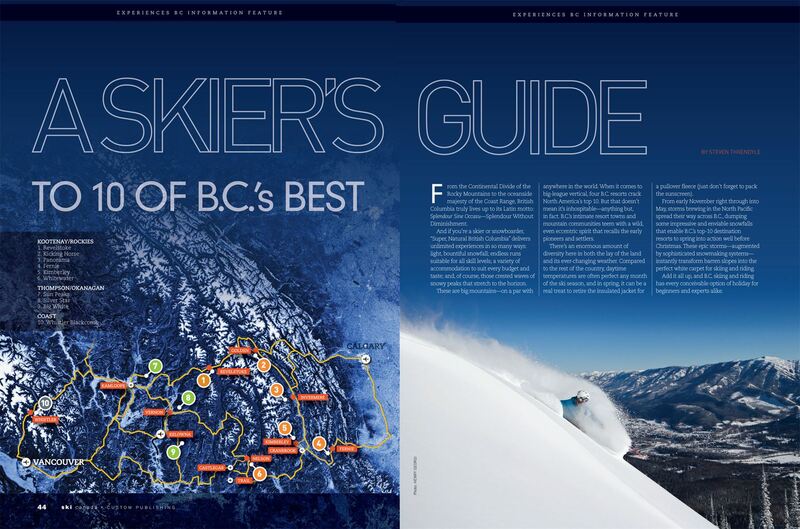 To access this seemingly endless amount of terrain, Whistler Blackcomb offers one of the world’s most advanced high-speed lift systems, with 18 express lifts and a total of 38 lifts. The world record-breaking Peak 2 Peak Gondola is an engineering feat stretching 4.4 kilometres (2.7 miles) between the tops of Whistler and Blackcomb mountains. With more than 100 restaurants and bars, Whistler’s pedestrian-only village boasts a vast selection of lodging options, totalling 10,000 rooms among more than 20 hotels, as well as hundreds of townhomes, condos, B&Bs and chalets—allowing the resort to accommodate in excess of 30,000 overnight visitors in properties ranging from luxury to moderate to economy. Shopping, dining, indoor climbing, a covered outdoor skating rink, indoor swimming pools and events—like Whistler Blackcomb’s weekly Fire and Ice Show featuring fire spinners, DJs, and ski and snowboard pros jumping through burning rings of fire—are all favourites. Besides downhill skiing and boarding, Whistler is home to a variety of other activities, including sleigh rides, cross-country skiing, snowmobiling, snowshoeing, winter fishing and ziplining. Visitors to the Whistler Sliding Centre can get their adrenalin fix by flying solo down the Olympic track on a skeleton sled or with a professional bobsleigh driver. 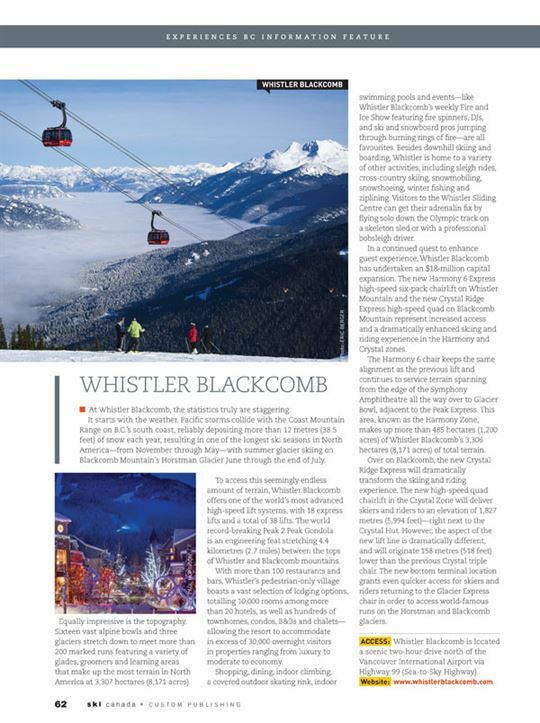 In a continued quest to enhance guest experience, Whistler Blackcomb has undertaken an $18-million capital expansion. The new Harmony 6 Express high-speed six-pack chairlift on Whistler Mountain and the new Crystal Ridge Express high-speed quad on Blackcomb Mountain represent increased access and a dramatically enhanced skiing and riding experience in the Harmony and Crystal zones. The Harmony 6 chair keeps the same alignment as the previous lift and continues to service terrain spanning from the edge of the Symphony Amphitheatre all the way over to Glacier Bowl, adjacent to the Peak Express. This area, known as the Harmony Zone, makes up more than 485 hectares (1,200 acres) of Whistler Blackcomb’s 3,306 hectares (8,171 acres) of total terrain. Over on Blackcomb, the new Crystal Ridge Express will dramatically transform the skiing and riding experience. The new high-speed quad chairlift in the Crystal Zone will deliver skiers and riders to an elevation of 1,827 metres (5,994 feet)—right next to the Crystal Hut. However, the aspect of the new lift line is dramatically different, and will originate 158 metres (518 feet) lower than the previous Crystal triple chair. The new bottom terminal location grants even quicker access for skiers and riders returning to the Glacier Express chair in order to access world-famous runs on the Horstman and Blackcomb glaciers. ACCESS: Whistler Blackcomb is located a scenic two-hour drive north of the Vancouver International Airport via Highway 99 (Sea-to-Sky Highway).